The No. 17 Quinnipiac Bobcats fell 4-2 on Saturday night to the Arizona State Sun Devils in a sloppy game marred by defensive breakdowns and foolish penalties. With the loss the Bobcats cannot finish the regular season in the top 16 of the pairwise and now must win the ECAC tournament if they want to reach the NCAA tournament for the fifth consecutive season. Come Monday the Bobcats are almost assured of falling out of the top 20 in the polls for the first time since October 27, 2014. The teams came out to a slow pace in the first period putting very few shots on net in the early going. Almost three quarters of the way through the period Arizona State struck first on a poor defensive effort by Joe Fiala who was in the lineup due to the injuries of both Derek Smith and Kevin McKernan. The Sun Devils Dylan Holloman got the puck around Fiala at the boards and fed it to a wide open Anthony Croston for the goal. Two minutes later the Bobcats took a too many men on the ice penalty. Just six seconds into the power play Arizona State won the face off and the puck ended up to the point where Brinson Pasichnuk blasted one home for a 2-0 Sun Devils lead. Jakob Stridsberg and Dylan Hollman picked up the assists on the goal. The Bobcats out shot the Sun Devils 11-8 in the opening frame. Early in the second period the Bobcats had a defensive giveaway on a mishandled puck by Karlis Cukste leading to an unassisted goal by Anthony Croston for a 3-0 Sun Devils lead. Freshman Andrew Shortridge was replaced in net by Chris Truehl. For most of the first part of the second period the Bobcats could not do much. They finally broke through on a power play goal by Tim Clifton on a wrist shot past the Sun Devil's Joey Daccord to cut Arizona State's lead to 3-1 to swing momentum towards Quinnipiac. That momentum was short lived when Jakob Stridsberg's shot front the point beat Truehl to swing the tide back into the Sun Devils favor. Quinnipiac out shot the Sun Devils 16-10 in the middle frame. The Bobcats dominated every bit of the third period except where it mattered the most on the scoreboard. Connor Clifton's wrist shot redirected off an Arizona State defenseman almost six minutes into the third period to cut the Sun Devils lead in half. Craig Martin and Tim Clifton got assists on the goal. 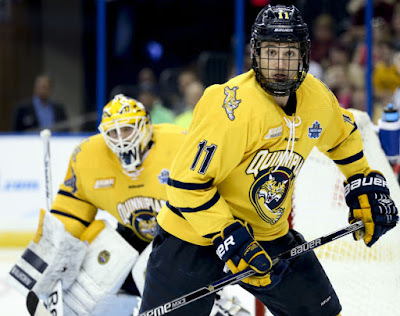 Quinnipiac continued to pepper Daccord with shot after shot to no avail and finished third period out shooting the Sun Devils an astounding 28-1 and 55-19 for the game. 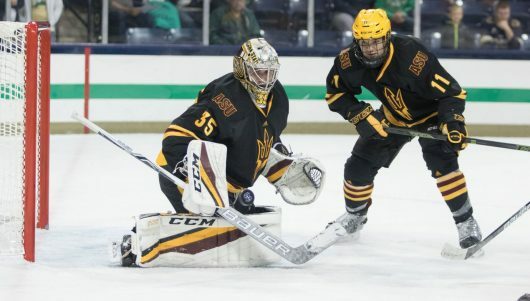 The difference in the game was the play of Daccord in net who had 53 saves on the night for the Sun Devils in the biggest win in the two year old program's history. The Bobcats with the loss fall to 14-11-2 and now head back into ECAC play for the rest of the regular season. Next weekend Quinnipiac heads on the road to Providence to face Brown University on Friday followed by a short trip down Whitney Avenue to face rival Yale on Saturday.